In recent years, the CRISPR-Cas system has gone from an unknown anomaly in bacteria to a technology that is quickly revolutionizing genetics. Found in approximately half of all bacteria, the CRISPR-Cas system provides protection from invading viruses and mobile elements. Comprised of RNA-guided, DNA-binding components of CRISPR (Clustered Regulatory Interspaced Short Palindromic Repeats) and CRISPR-associated (cas) proteins, both are required as part of this adaptive immune response. 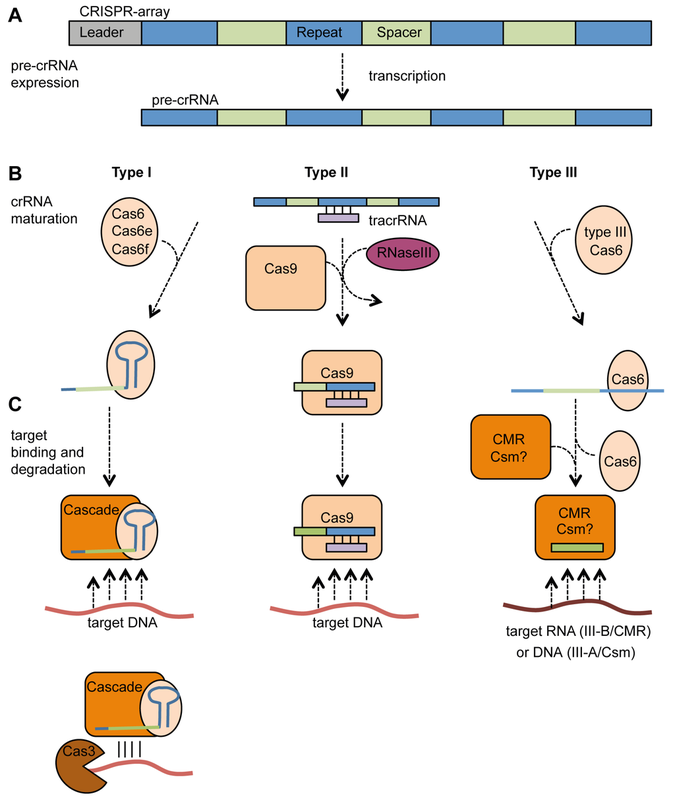 To date, three major types of CRISPR-Cas systems have been described, each defined by unique sequence requirements and “signature” components required for mechanistic action. Type II CRISPR-Cas systems, most notably CRISPR-Cas9, recognizes a 20bp sequence and produces a double-strand break at an adjacent 3bp PAM motif. The result produces a frameshift mutation or initiates homologous recombination-mediated repair, which have been harnessed by researchers for genome editing technologies in an ever growing number of species. Cartoon showing the basic differences among CRISPR systems. Note that Type 1 systems have a separate cas with endonuclease activity (Cas3) while the Cascade complex is involved in targeting. This is in contrast with Type II systems where the targeting system also has endonuclease activity (Cas9). Rath et al. (2014) focus on a Type I-E CRISPR-Cas system in E. coli where cas proteins interact to form an immunosurveillance complex called Cascade. Comprised of five cas proteins, the Cascade system binds to DNA following detection of a 32bp target sequence and subsequently recruits Cas3 for DNA cleavage at an adjacent 3bp PAM motif. Based on the ability of the Cascade system to assemble on DNA in a site-specific manner, the authors wanted to test if this Cascade complex could silence transcription in the absence of Cas3-mediated cleavage. Using cas3-deficient E.coli, Rath et al. (2014) demonstrate that the Cascade system could effectively silence GFP expression by targeting cas proteins to promoter regions or the GFP open reading frame (ORF), suggesting that Cascade could interfere with both transcription initiation and elongation of plasmid- or chromosomal-based targets. Further experiments demonstrate that Cascade-mediated silencing is stable and long-lasting, with the ability to silence multiple targets simultaneously. Importantly, Rath et al. (2014) also demonstrate that Cascade-mediated gene silencing can be transferred to heterologous systems using multiple E.coli strains and other bacteria species (S. typhimurium). Comparison of Type I, II and III CRISPR systems. In summary, these findings suggest that the Cascade system can be used to effectively silence genes by interfering with transcription. While further experiments are required to measure the efficiency of gene silencing in eukaryotic species, the success of other CRISPR systems across metazoan strengthen this argument. Two examples of how endonuclease defective Cas9 can be targeted to genes in ways that can potentially silence them. Of interest, recent reports using a catalytically inactive Cas9 produced similar effects on gene silencing in multiple organisms (Qi et al. 2013, Bikard et al. 2014). While these have yet to be directly compared, the Cascade system offers some advantages over its Cas9 rival. Cascade utilizes a larger targeting sequence (32 vs 20), making it less prone to possible off­-target effects. The Cascade system also is comprised of five Cas proteins that bind to the respective DNA to inhibit transcription, compared to only the single Cas9 protein, possibly offering more steric hindrance and greater interference to transcription initiation and elongation. As a result, it would be interesting to compare the efficiency of Cascade vs a “dead” Cas9 system to silence a gene of interest. In the meantime, the Cascade system adds a new tool to the CRISPR genetic toolbox. The Drosophila RNAi Screening Center (DRSC) - A functional genomics resource useful to all insect biologists.